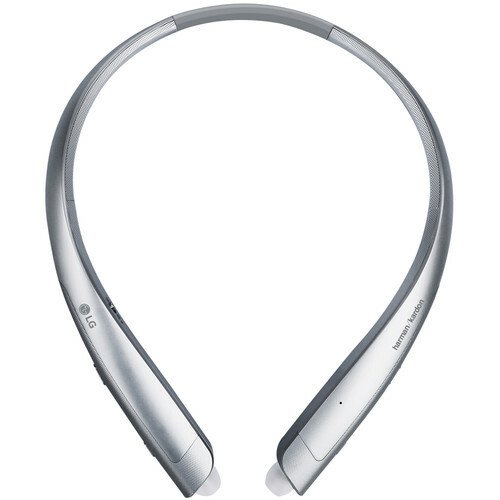 The HBS-930 TONE Platinum Alpha Wireless In-Ear Headphones from LG features metal multi-layer speaker units and audio tuning by Harman Kardon, which are meant to deliver high-quality mobile audio performance. The TONE Platinum headphones stream audio wirelessly via Bluetooth technology from compatible mobile devices, such as a smartphone or tablet. With dual MEMS microphones, you can enjoy clear and uninterrupted conversations when paired with a smartphone. Regardless of how you use your HBS-930 headphones, they are always at hand thanks to their sleek neckband design. When you're ready to use them, simply pull out the built-in retractable earbuds. When fully charged, they have enough power for up to 14 hours of music playback, and it only takes approximately 2 hours to fully recharge them. Box Dimensions (LxWxH) 8.25 x 7.25 x 1.75"
HBS-930 TONE Platinum Alpha Wireless In-Ear Headphones (Silver) is rated 4.4 out of 5 by 5. Rated 5 out of 5 by Buck from Hbs930 Been using lg headphones for years. So far this is my favorite. Had hbs 910, 920. Didnt care for the 920s. Went back to 910s for a year till these came out. They sound great they moved on off button to right side instead of left. And charging port. Battery life is better than other headsets. I work 12 hour shifts and these Allways make it through the night no problem. Rated 5 out of 5 by Raychel from Great product @ great price! Ive used LG Tone headphones for a while & this latest model is a noticeable improvement to an already excellent line of products! 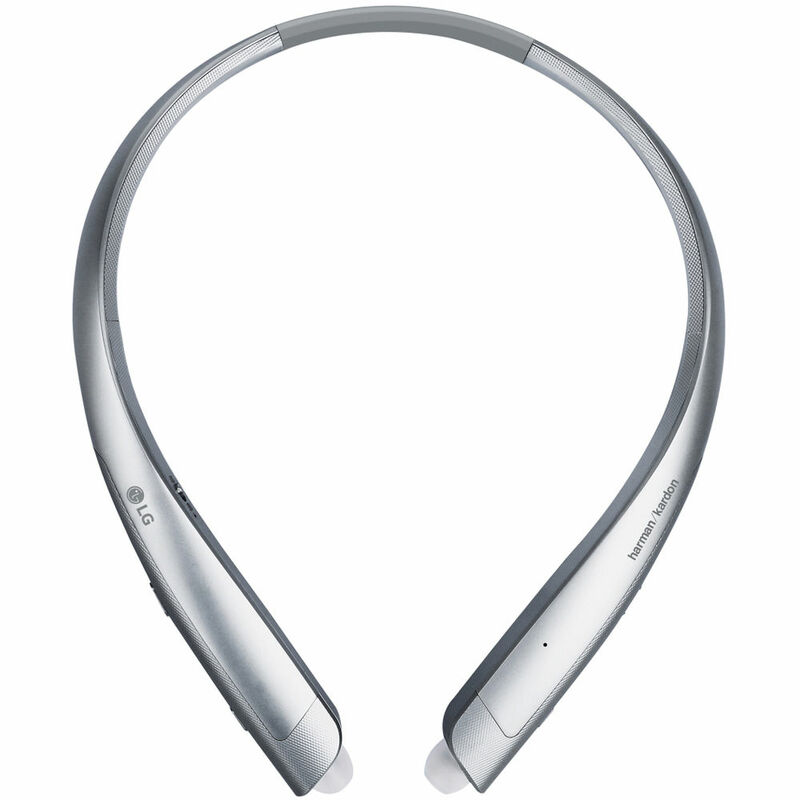 The sound is amazing, the headset is comfortable & the battery is long-lasting. I searched all over, & B&H has the best price anywhere! Rated 5 out of 5 by Gwendolyn from It is completely fine It is completely fine, but I can’t say I like it any better than my quite old HBS-800. Those have noise cancelling and are more comfortable. They can fit in a smaller place. Because they are cheaper I don’t worry about losing them. The earbuds on these retract and stay put, unlike the HBS-800. People I talk to on the phone don’t complain about being able to hear me. The sound quality is fine. The battery life is fine. Everything is fine, but so is something much cheaper. Rated 5 out of 5 by Nasser from Excellent and reliable, as expected I purchased a past iteration of this very same product back in 2013, and I continued to use it for 6 years (till early 2019) and it worked beautifully and reliably for the work commute, international travel, while running etc.. I would venture to argue its the best blue tooth set of headphones Ive ever come across. Rated 2 out of 5 by LG Fan No More from disappointed Ive gone through four of the HBS-900 (black, gold and two silver, all purchased from BHP). Im on my last one (a silver) as the previous (black) broke due to a drop. I was going to buy another HBS-900 (I always like to have two headsets to ensure I have enough battery to last a full day), however its been a few of years since I last purchased one and now BHP and other retailers are out of stock (discontinued). I was going to try the 920 since they were $60 cheaper, however the 930 just went on sale. I was very excited to see how LG had enhanced their product, as I was very satisfied with the 900. To my surprise the 930 is nothing like the 900. The first thing I noticed is the distorted and muffled voice prompt (it was crystal clear on the 900). Connecting to my LG tablet takes less than a second on my 900, with the 930 it takes 5 to 7 seconds. When paused there is a noticeable background hiss on the 930 (other headsets have this too, even the 900, however its very unnoticeable on all but the 930). The volume beep on the 930 is extremely loud (its louder than the music I am listening too, in fact its painful enough that I cant use it), on the 900 its barely noticeable. Needless to say I am very disappointed. I have been a big fan of LG gear (I have their phones, tablets and even big appliances like TVs, washer and dryers). I have no choice but to return the 930 as I cant use it due these issues (the biggest being the volume beeps). I will try to fix my black 900 with crazy glue so that I can hopefully get another year or two out of it (maybe LG will fix these issues with their next model, or maybe I will try my luck with the 920 since there are a few still in stock). Note that this could have been a faulty product due to manufacturing issues, however since there are both Bluetooth and audio issues, I doubt it.